This is a PBL (Problem-Based Learning) activity for introductory physics relating to circular motion and friction. In this scenario, students design a flat circular highway exit and determine, within a set of given constraints, what the exit speed limit should be. Students will apply concepts of rotational kinematics, static and kinetic friction, and will explore the dynamics involved in an object moving in a circular path. This resource includes a printable student manual and a password-protected teacher's guide with solutions and tips for instructors. 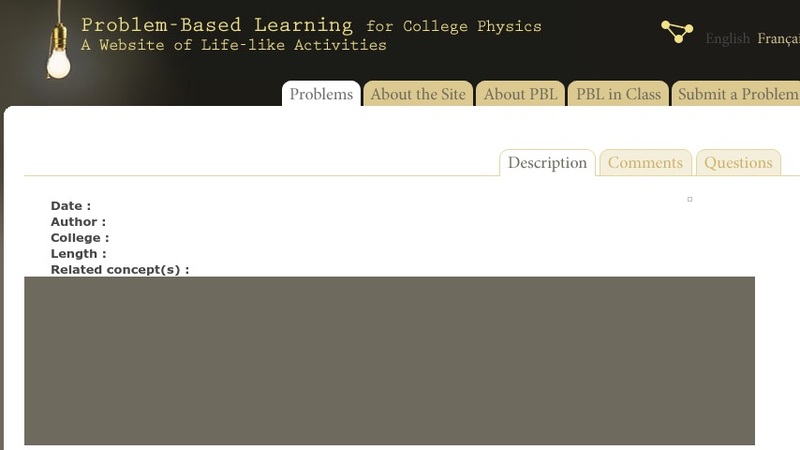 PBL is an instructional method designed to strengthen student competency in reasoning and problem-solving. The activities mirror real scenarios encountered by practicing scientists and engineers. Learners sift through information to separate useful from irrelevant data, locate missing information on their own, and then apply physics in finding solutions. Synthesize information from a range of sources (e.g., texts, experiments, simulations) into a coherent understanding of a process, phenomenon, or concept, resolving conflicting information when possible. Reason quantitatively and use units to solve problems. Apply geometric methods to solve design problems (e.g., designing an object or structure to satisfy physical constraints or minimize cost; working with typographic grid systems based on ratios). ?